Kick off 2015 the right way with a free guided nature walk along the trails of scenic Mill Creek Marsh. 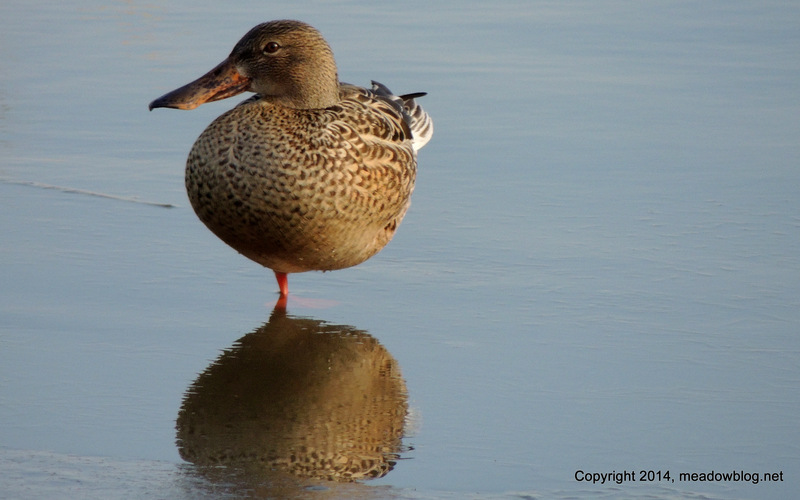 We are offering a 25-cent reward to the first person to see a Eurasian Green-winged Teal, a dollar (U.S.) to anyone who sees a Gyrfalcon, and a pat on the back to anyone who sees a No-Sho (Northern Shoveler, above). 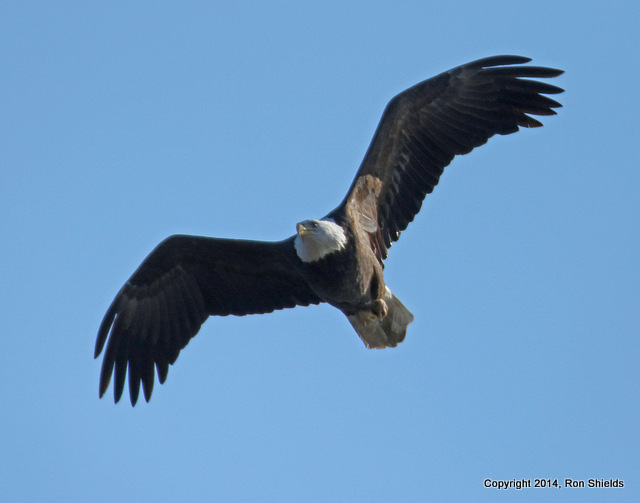 What better way to end the year than with a Bald Eagle from the Meadowlands? For those keeping score at home, this is the Bald Eagle we often see perched on the 1-E Landfill. Earlier today, it was nice enough to fly toward us, almost directly overhead. Coming Monday: Ron’s pix of Alice and Al on the nest in Ridgefield Park. And don’t miss Ron’s talk at the Meadowlands Environment Center on Wednesday, Jan. 14 at 2 p.m. 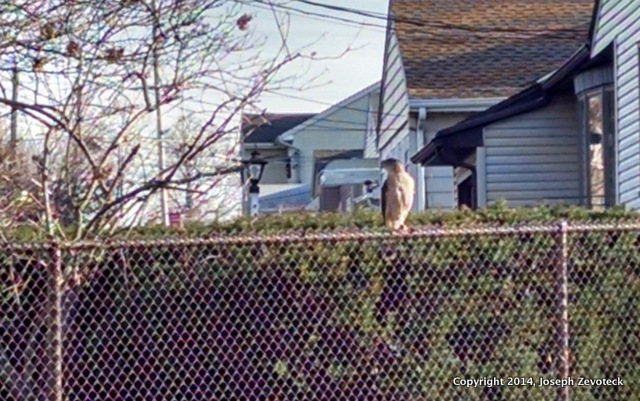 Earlier this week, I saw a pair of falcons at Laurel Hill Park in Secaucus. 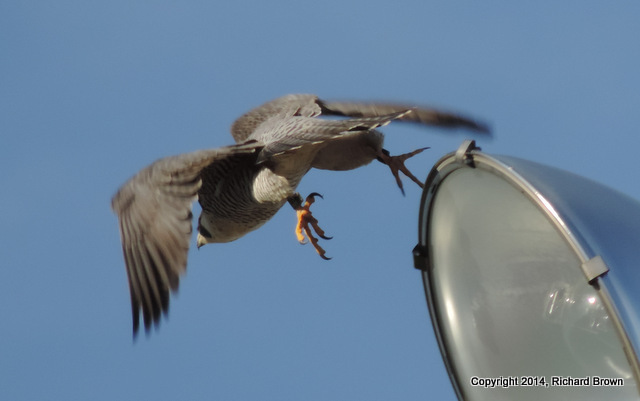 When I first got there at noon, one falcon was circling above and one was in the old raven nest. Soon they flew off towards the river. 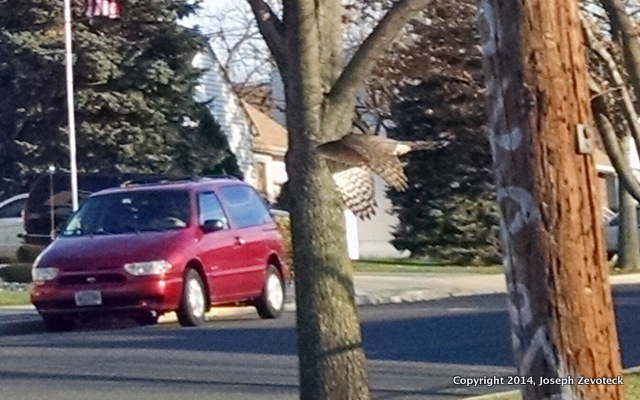 About an hour later, I saw them both chase off a Red-tailed Hawk that got close to the nest site. 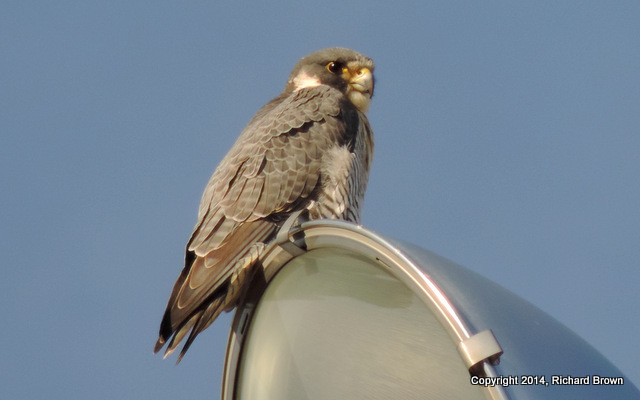 One of the falcons then perched on a ball field light and I got some photos. (Thanks, Richard!) Does this band number sound familiar to anyone? What is your choice for Meadowlands bird of the year? In conjunction with our latest South Bergenite column, which follows, we are asking members of the Meadowblog community to vote for their favorite Meadowlands bird of 2014. So read the column by the NJMC’s Jim Wright — and then vote! 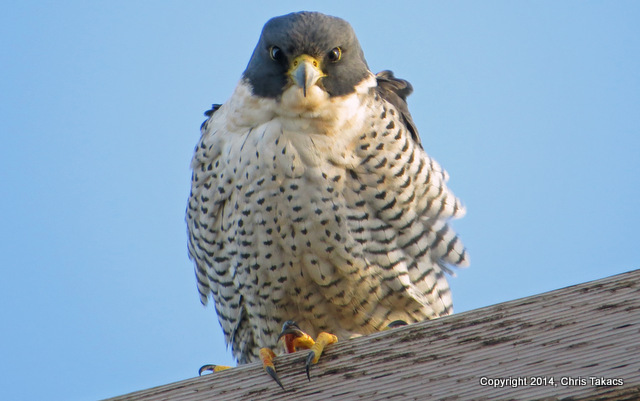 For local nature lovers, this past year will be remembered as a year of rare and unexpected birds — so many, in fact that we at the N.J. Meadowlands Commission would like you to vote for the 2014 Meadowlands Bird of the Year. When Mike speaks, I listen. Sometimes you see a bird and you don’t have your binoculars, but you really want to try to I.D. it anyway. Just click on the text to link to the post. Thanks, Ray! Schmidt’s Wood directions are on the right-hand column of this blog. 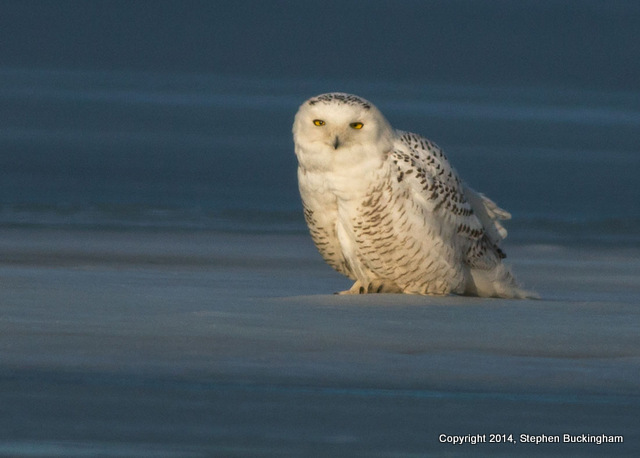 This could be another great winter for Snowy Owls, according to the Cornell Lab of Ornithology. For their forecast, click here. The article also explains why we had so many last year. At one point, we had four Snowys in DeKorte Park last winter. Heck, we’d settle for only one this winter. If you see any, please let us know. For more Meadowlands Snowy Owl pix, just search the blog, using the search engine in the upper right corner of this blog.